Which one is the antique? Read below to be in the know! Going on a hunt for that special piece? I don’t know about you, but I don’t keep my reference book in my back pocket and I surely don’t want to pull it out while negotiating a purchase either. So what are some clues that you can use that will help you spot a “Good-buy” or “Good-bye”? Here’s three easy tips! • By the early 1900’s almost all backstamps / marks were inked on (printed). This fact alone will help you figure out the approximate age and whether you are merely buying a collectible or a true antique. If the backstamp was pressed into the item, there is a good chance that it is older. Yeah! • If the backstamp does not include a “Made in” stamp, it was made before 1921. This is a direct result of the Stamp Act of 1921, where the country of origin became required on imports. • Consider the glaze. Items that are 100+ years old are not perfect. Not only were they most likely hand crafted and have imperfections, the glaze does not last forever. If there is no crazing (tiny hairline irregular cracks in the glaze) whatsoever, that should be a red flag. True, there are exceptions but a general rule is that the item needs to look its age. Warning: Too much crazing can reduce the value of the item. You should also be wary of new items that are now fired with a crackle glaze that resembles crazing which will cover the piece. Don’t worry though, after you’ve seen a few you’ll be able to spot the difference like a pro! Look at the two pieces in the above picture. Could you tell which one is the fake? If you thought the pretty Hull Vase was real…You are right! 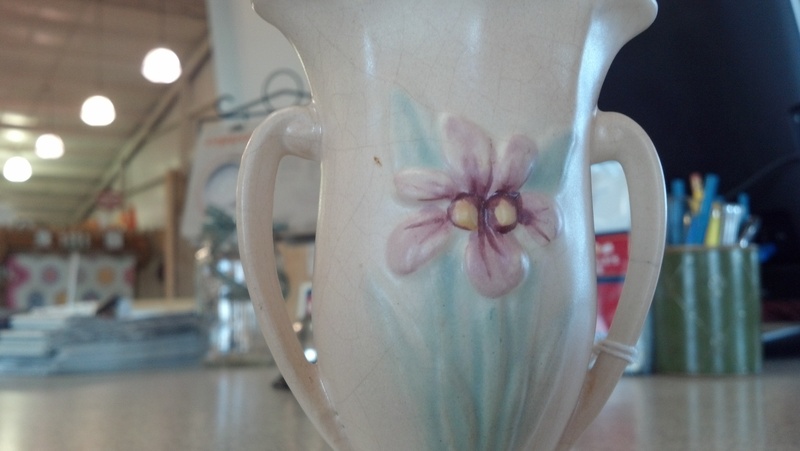 This entry was posted in Antique Tips, Ceramics by fkantiques. Bookmark the permalink.